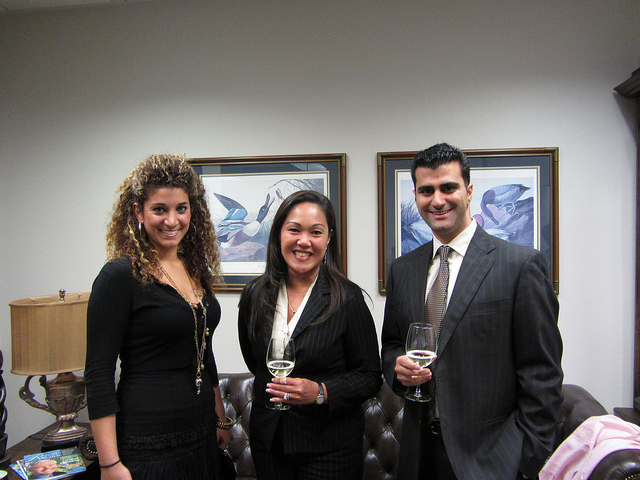 The Law Collaborative has partnered with the State Bar of California to provide licensed attorneys with MCLE Credits. 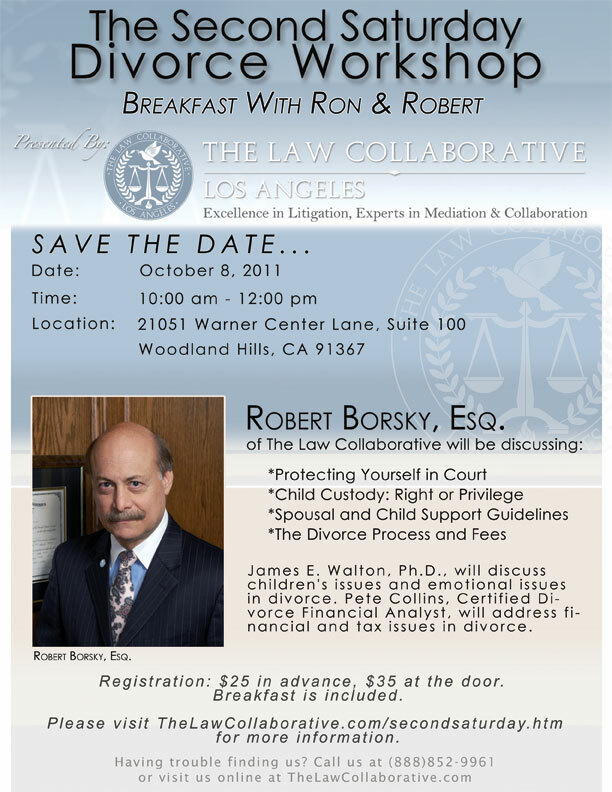 Our October 18 seminar, Tips, Tricks & Strategies for Divorce offers attorneys 1 MCLE for $25. If you’re an attorney interested in adding family law to your menu of services, this 90 minute seminar will teach you important tips, tricks, and strategies for moving cases forward, how to better protect a client’s assets during divorce, why fighting for a client to keep the family residence may hurt them in the long run, and common divorce-related tax issues most family law attorneys don’t appreciate or understand. This seminar is also ideal for those with no legal background who are in the process of divorce. Do you feel like your case is stuck? Is negotiating with your ex impossible? Are you unsure of where your case is headed or how to take the next step? Pourya Keshavarzi, Esquire, and Irene Smith, Certified Divorce Financial Analyst, join forces to provide you with important information that will help you protect yourself in court, tricks for effective negotiation, and strategies for moving your case forward. 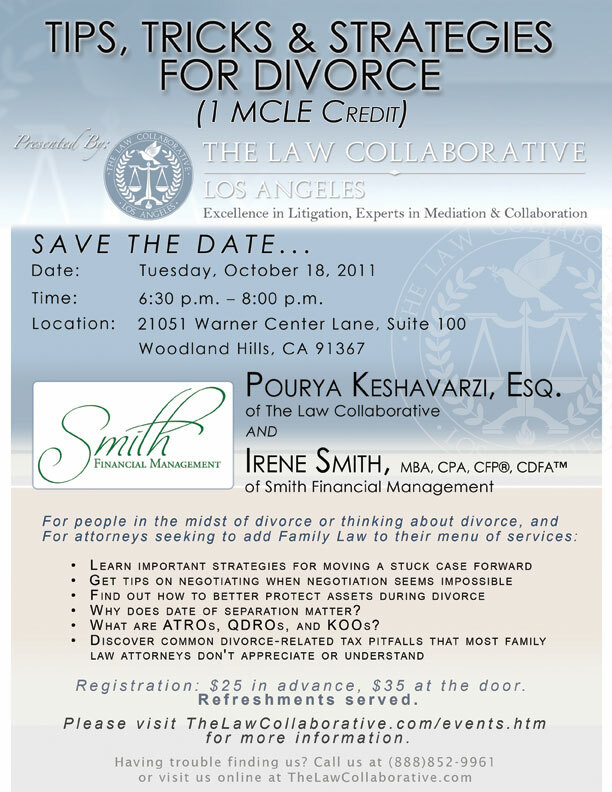 Join us at our office in Woodland Hills on Tuesday, October 18, 2011 from 6:30 p.m. to 8:00 p.m. for Tips, Tricks & Strategies for Divorce. Refreshments will be served. Register online today for $25 or call us toll free at (888) 852-9961. To see some of the other upcoming events we have planned, visit www.thelawcollaborative.com/events.htm. Would you like some cheese and crackers with your wine? 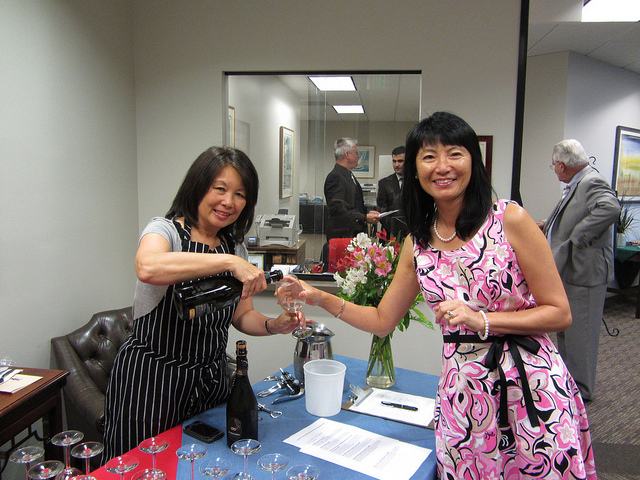 Here’s Irene getting her first pour of the evening from Janice, co-owner and co-founder of The Accidental Wine Company. Good food, good wine, and great information at The Law Collaborative. 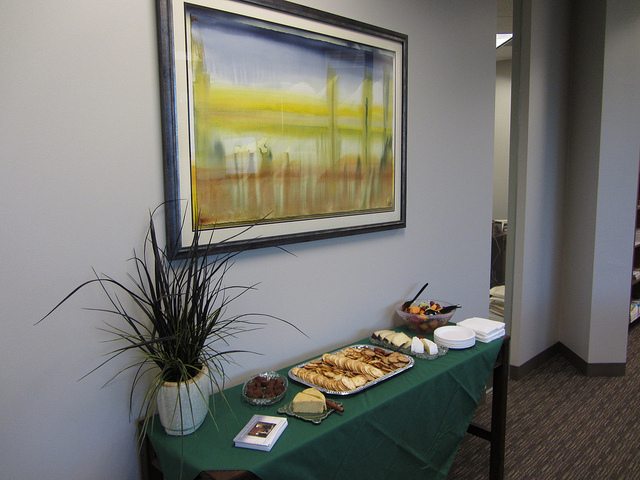 Speaking of food, there was a fabulous array of hors d’oeuvres to nosh on, which I sadly did not get a picture of. I’ll know better for next time – but maybe you’ll be there to eat it all in person? 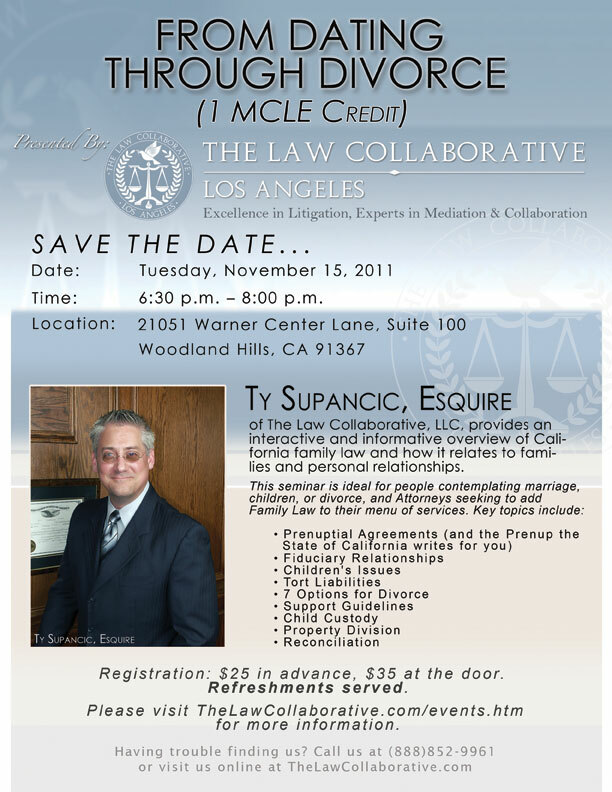 Visit our events page at www.thelawcollaborative.com/events.htm. We’ve got lots of brand new seminars planned, including Retirement Illusions: Where do we go from here? and Best Kept Secrets in Family Law: What divorce lawyers don’t want you to know. These seminars are extraordinary opportunities to educate yourself with regards to your finances, your retirement options, and how to protect yourself, your assets, and your kids during a divorce. For more information, visit www.thelawcollaborative.com or call us at (888) 852-9961. We are here to serve you.